This is my second LootCrate J.K. Rowling's Wizarding World subscription box - first one, themed Defense Against The Dark Arts, was a huge success and kept me wanting more! I originally subscribed on a month-to-month basis, and I will wait until my 3rd box in November to see if I want to make a bigger commitment with a 3-month or 6-month subscription. This month's theme for the Wizarding World Harry Potter subscription box from LootCrate is - Magical Essentials! Things you will find very handy once your Hogwarts term kicks off. The box comes in black, as they always do - but this time if you fold it inside-out, it becomes this awesome Hogwarts trunk box! I love this bit, and because the box is large and roomy, it will definitely stick around to hold some of my most precious Harry Potter treasures. I present to you - the Slytherin scarf! This amazing soft-knit muffler comes in beautiful Slytherin colours of moss green and silver grey, and features a Slytherin badge. The scarf is of amazing quality - soft, long (enough to wrap around twice without choking) and definitely Hogwarts-approved. The Slytherin scarf design of wide, alternating colour strips is actually based on the first-years' scarf design, as older Hogwarts students wore house scarves with thinner, denser stripes in later movies. Not complaining - I just wanted to share some of my knowledge and obsession! Next up, another piece from Ollivander's Wand Pen collection - Harry Potter's wand (pen)! Just like Snape's wand pen from the previous Wizarding World box, the make and quality of the Harry Potter wand pen is leaps and bounds above those available from the Noble Collection or Warner Bro's Making of Harry Potter studio tour. The pen comes in the trademark black box, with embossed Ollivander's design, and features a black-velvet lined inner case - absolutely stunning! The pen itself is made from resin, making it hefty and very sturdy. The detail on these wand pens is out of this world - the Harry Potter wand pen looks exactly like the actual wand. The whole thing is of fantastic detail and quality - worth purchasing these boxes just for these deluxe Ollivander's wand pens! Then, we come to another item that is Slytherin themed - but not by house, thus all of you who ordered these boxes will have it. This is another piece to add to your Horcrux brooch collection - the Slytherin Locket pin. Heavy, featuring bejewelled S design (for Slytherin, of course) and a multi-faceted resin cut, this locket pin is another testament to the overall magnificent quality and attention to detail that has been put into making these items. The back has two pins, so our own Slytherin locket Horcrux will stay in place! Oooh, a box from Honeyduke's! I wonder what's in there?.. Why, it's four delicious-looking erasers that were designed based on the most famous Honeyduke's sweet treats! 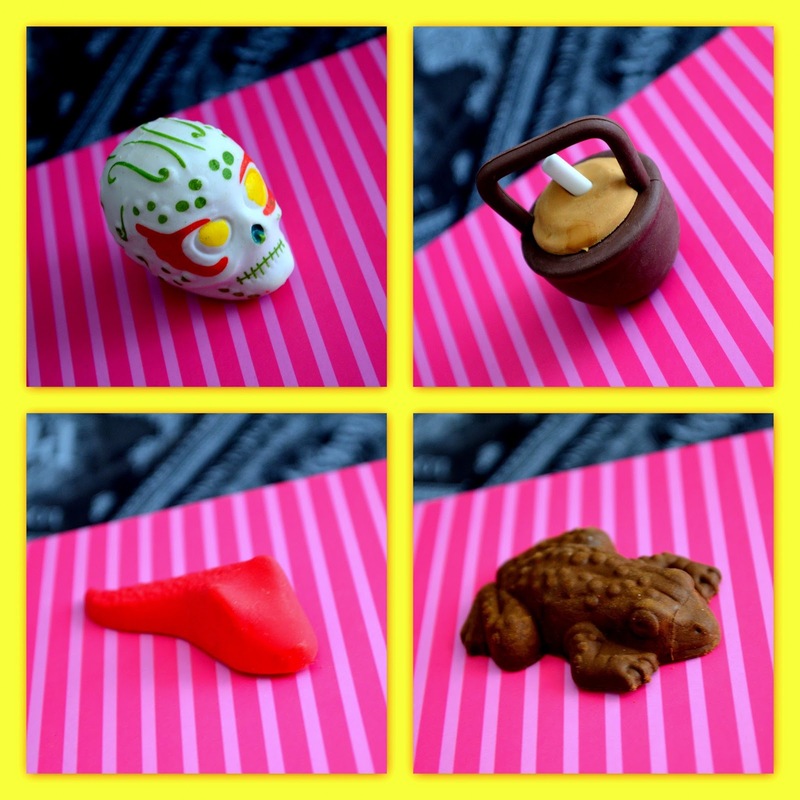 The four erasers are - Sugar Skull, Cauldron Cake, Jelly Slug and, of course, Chocolate Fog. They are unscented - I think it's to make sure children don't mistake these for actual treats because they do look quite convincing. They are heavy and well made, and will be the highlight of anyone's pencil case! Way to make school more fun, right? Finally, another addition to your stationery obsession - I mean mine - a MACUSA Office stationery set! The box contains a folio for all your inter-departmental memos, 2 paper clips that will watch over your cases, sticky notes that will come in handy when declaring magical emergencies and a list pad - so you never forget just how many howlers are due to be sent out to misbehaving wizards! Again - attention to detail here is mind-blowing! The folio has name & date tags, the pins are of very sturdy brushed metal, the sticky notes are awesome with their Magical Emergency Level markers, and the list pad features a faded parchment look and the M.A.C.U.S.A logo on every page. Seriously - keep this on your desk, and curse anyone who calls your unprofessional! Love it! Another month - another success! I am absolutely loving the J.K. Rowling's Wizarding World subscription boxes from LootCrate thus far. The quality is amazing, every item is something you'd be happy to own, and not just a throwaway token, and there's something for everyone's tastes! I absolutely can't wait for the next box, ready for spoilers?? November's theme is 'Secrets of the Wizarding World'! Again, it's keeping me on my toes, and I really hope to see some exciting bits. It doesn't sound like it will be house-themed, but you never know. If my count isn't wrong, we're still missing 2 Horcruxes - hopefully one of them hides in the November Wizarding World box! For now, I leave you with the above - don't forget to get your own box here!